Exactly a week and one day ago we unveiled Book of Demons to the world, a project that we’ve been working on in secret at Thing Trunk for almost 4 years. And it was an absolute emotional roller coaster! It started like a disaster, but by some means, we still managed to reach the goals we set for ourselves. Today we’ll take a break from the regular project announcements and development updates we did so far, and I will share some of my thoughts on what went good and what went bad with the most important announcement in the history of Thing Trunk. One that would decide our company’s fate, if we could stay indie or not. Imagine for a moment that one day in your life you had an idea. The greatest idea of your life. You got with your friends and colleagues and started working, thinking that nothing is more important than bringing it to life. You even scrapped your earlier companies and formed a new one so that you can have an absolute focus on what you are trying to achieve. Then you pushed hard, but the project opposed. It turned out to be hard, difficult and complex. Nothing like anything you did before. Each step of the way proved to be a small mountain you needed to climb. But you didn’t let it discourage you. Challenge by challenge, you tackled them all. But it took a lot of time. Much more than you initially planned. It took a lot of money. Much more than you initially planned. It tested your patience and devotion, erected every roadblock in the book. You had to make sacrifices, even admit some parts of the path were not accessible to you. But it was the whole of the journey that mattered, and the peak you were climbing onto. The goal. The few paragraphs above should resonate with anyone who got passionate about something and struggled to bring it to life. 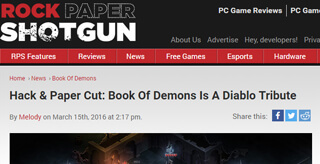 But this one is about us – the idea of Return 2 Games, our bumpy journey of creating the first game in the series, Book of Demons, and the challenge of bringing world’s attention to our project. It’s not a secret anymore that marketing indie games is hard, everyone shouts about it. So let’s just jump straight into the interesting part – what we did and how it turned out. We didn’t do a lot of marketing before now. We had some experiences from our earlier companies, but back then we worked on casual games, and casual games didn’t need any promotion. Seriously, you just had to make a great game (and I’m proud to say that we did make some great casual games at Codeminion), send it to a bunch of distributors, and they would do the rest. Your job was done, you could sit comfortably and count sales pouring in. Last year, we did a smaller reveal event when we unveiled Return 2 Games, the series that will bind all the games together. We prepared a good looking teaser trailer, a teaser website and pushed some Press Releases to the media. The coverage was very limited (not to say abysmal), but after doing some soul searching we realized that it wasn’t very newsworthy. It was just a slightly convoluted announcement from an unknown indie studio that didn’t reveal anything really specific. So our expectations were low at this point. The main goal was to come out of hiding and make sure that there was any kind of news backlog about us when we would be doing the real marketing push, revealing the first game several months later. People liked the trailer, some even got excited. We just didn’t get the clicks and the media didn’t open or answer our emails. But we quickly forgot about it and the marketing team went into slumber (meaning we changed our hats and jumped back into coding). Fast forward a few months, to about 6 weeks before now. At this point, the game was 95% feature complete. It was still a very long way before it would be done, and we still have a lot to do before we’ll eventually start testing it with outside gamers. We still got tutorials to do, balance and optimize the game, a lot of sounds are missing. We also need to integrate our back-end with Steam, which is tricky in our case. Anyway, according to our rough marketing plan it was high time to announce the project and start building a community around it. It was time for another marketing event, but this time nothing could go wrong. It was to be our live or die moment, in a sense, and the level of anticipation in the team was extreme. We had a rough marketing plan since about a year ago, so we knew what we wanted to do. We needed a website, a gameplay trailer, good PR and a press kit. We also did learn some do’s and don’ts with the previous event, and we wanted to make all kinds of improvements to our PR methods. First, we started preparing much earlier – a month before the event, which we thought would be more than enough. Second, this time we wanted some outside help, a professional to be involved in the announcement. At first we wanted to hire an established American PR company specializing in games, but it turned out to be a bad idea. We reached out to two larger companies that had a good track record, but it turns out those people are seriously busy (we just got a very positive reply from one of those companies, sadly a week after the event) and that we generally can’t afford them. They had some ultra-cheap, indie-friendly packages, but after doing some research we decided we could spend this money better. Everyone advices against taking a free PR agency, and they are probably right. First, the part that shouldn’t be surprising. One month of preparation turned out to be not enough. We had to make last minute changes to the website and drop entire sections because they weren’t ready. We were still changing the trailer and the final version was ready just one day prior to the announcement. We decided to follow this advice and it meant more changes like making shop integration a week before the event. We also suddenly had to talk with Steam and Humble Store, so that we could promise Steam keys. So it was a wild ride, but as you know thanks to the help from the great folks of Valve and Humble we managed to get everything set-up and we even skipped Greenlight because the game looks so promising. A day before the announcement one of the PR reps told us that we need to change the date of the announcement, otherwise our reveal would clash with the reviews of the new Hitman game going live. This is not something you want to hear a day before the announcement you were preparing for months. We had already teased the date, scheduled some interviews and contacted many press contacts in advance. Also, no one could guarantee that another date would be entirely safe (you never know when someone notable decides to reveal something extraordinary any day). So we made the only possible choice – decided to stay with the original date and see what fate had in store for us. The day zero came. The atmosphere was very calm at Thing Trunk. Somehow we got everything prepared on the last minute and we were ready to execute. We had a big list of checkpoints on our wall that we would follow. At noon Polish time, we launched the website and the trailer and started testing it. It was safe as the US was still sleeping. At 2pm we started sending our Press Releases (we used GamesPress.com, GameRelease.net, RobotSaid.com, PRLog.org) and we also emailed our personal list of press contacts. We started posting stuff on social channels and announced the game on our blog. We also did other stuff, like posted the announcement on forums we frequent, N4G and IndieDB. Our post on Reddit drowned, but fortunately someone else did a better job (we got 96 upvotes on r/gaming, mostly thanks to Konstanty’s handling of comments). This was great, but we knew Polish websites take a special interest in Polish studios so it wouldn’t necessarily translate to worldwide coverage. And it didn’t. At first, everything looked very quiet and gloomy. The PR reps we worked with didn’t help to alleviate our fears. One of the reps reported sending the announcement to PR contacts and said that if we don’t get any coverage today than it’s over, no one will write about us. It also turned out the reps could have prepared better – one of them turned out not to know how to handle twitter properly, the other one failed to send the announcement on time, due to a problem with an untested mailing platform (it was delayed one day). Yes, the starting point wasn’t very good. We didn’t make the same mistakes as earlier, we made new ones. The PR reps helped, but their work also wasn’t perfect. The real question was if what we together did was enough for someone to notice us, to notice the great game we are bringing to life. The event could certainly have gone better, but we’ve reached our minimum goal – to get at least one mainstream website to cover our announcement. Of course, we’d love to reach a broader audience and it seems we will have to put a good fight for it. But the first small step was done in the right direction and it’s a good place to start. That’s a tough one. We knew a lot of the stuff we prepared could be better even before the announcement but we didn’t want to postpone the reveal, tweaking everything indefinitely. Most of the improvements will be coming along in the coming weeks (mostly tweaks to the website, etc.) and what we didn’t get the chance to reveal will be included in the next announcements. There’s never enough time to prepare. If you think you need a month to prepare, it’s probably two or more. Don’t get others to walk over you. You will be in stress, focused on tasks at hand and everyone will have better advice. Don’t trust them immediately. Trust the decisions you’ve made when you were calm and provident. We’re happy we didn’t jump ship and delayed the event on the first sign of trouble. Don’t be scared if things don’t work immediately. Give it time. Marketing has a fair bit of latency and sometimes it just doesn’t click immediately. As for the PR reps, our work with them could certainly have gone better. But if we got to repeat the event, we certainly wouldn’t risk not taking their help. We have good news. We have bad news. 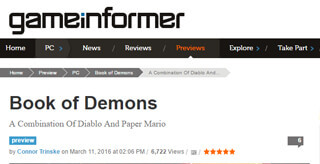 There’s a lot of exciting stuff coming up ahead about Return 2 Games and Book of Demons. The initial reception was good, but we need to press harder and reveal more interesting stuff in the coming weeks. The good news is we still have a lot to show as we only scratched the surface. We just can’t wait to share all the exciting stuff with you guys. The bad news is that marketing is taking a big toll on game production. We’re only a six person team and doing PR work even with outside help totally destroys our workflow. This is something we will have to sort out shortly. I wrote that a month ago we had about 95% of the game’s features implemented. Well, today it looks almost the same. The next marketing events will have to be carried out differently if we want to keep the release dates we promised. 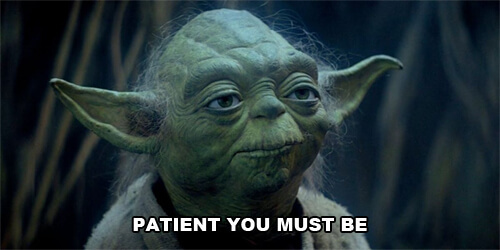 The pre-orders are slowly selling – nothing exciting yet to report as the traffic to our website is very small, but we have a strong conversion rate (almost 1% for pre-orders is very good) and the full Supporters Bundle is our best-seller – so we are looking into expanding our team with a dedicated PR person. Ok, it’s time to wrap up. Hope the post wasn’t too long and that you found it interesting. If you have any questions or words of advice, please let us know in the comments below! Thing Trunk is an independent game development studio and a creative team behind Return 2 Games - a series of unique mid-core games inspired by the golden days of PC gaming. Only top quality mid-core games - engaging games that respect your time and can be enjoyed right from the start. Why should you care? Here is a full write up. Also: Make sure to check out our ever growing list of midcore games.